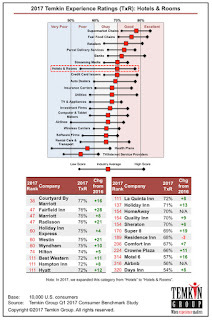 A survey of 10,000 consumers conducted by customer experience research, consulting, and training firm The Temkin Group showed that Courtyard by Marriott delivered the best customer experience in the hotel and rooms industry. 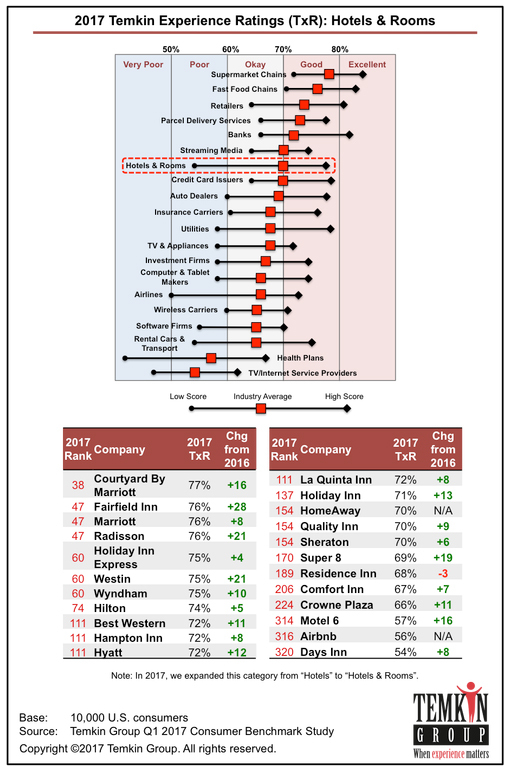 Courtyard by Marriott took the top spot out of the 23 hotel chains and alternative lodging options included in the 2017 Temkin Experience Ratings, an annual customer experience ranking of companies' ratings. Courtyard earned a score of 77 percent and came in 38th of more than 300 companies evaluated. "Unlike most other industries, there are no clear customer experience standouts in the Hotels & Room category,” Bruce Temkin, managing partner of Temkin Group, said. “The leaders change every year, which leaves the door open for any of the chains to become the industry standard for [customer experience]." Now in its seventh year of publication, the 2017 Temkin Experience Ratings evaluates 331 companies across 20 industries. In addition to hotels & rooms, which was updated in 2017 to include Airbnb and HomeAway, the survey evaluates airlines, credit card issuers, rental cars and transport, among several others. Fairfield Inn, Marriott, and Radisson all tied for second place in the hotels & rooms category, each with a rating of 76 percent and a rank of 47th overall. To generate these ratings, Temkin Group asked 10,000 U.S. consumers to evaluate their recent experiences with a company across three dimensions: success ("Can you do what you want to do? "), effort ("How easy is it to work with the company? "), and emotion ("How do you feel about the interactions?"). Temkin Group then averaged these three scores to produce each company's Temkin Experience Rating. In these ratings, a score of 70 percent or above is considered "good," and a score of 80 percent or above is considered "excellent," while a score below 60 percent is considered "poor." Overall, the Hotels & Rooms industry averaged a 70 percent rating in the 2017 Temkin Experience Ratings and tied for 6th place out of the 20 tracked industries. The average rating of the industry improved by 10 percentage-points between 2016 and 2017, going from 60.4 percent to 70.2 percent. The ratings for all but one hotel increased between 2016 and 2017. Fairfield Inn improved the most, gaining 28 points, while Residence Inn declined by three percentage points. The 2017 Temkin Experience Ratings, along with other ratings, can be accessed at the Temkin Ratings website. More information about the Tempkin Group is available at the organization's website.